But I’m not one to be sold on promises, so I’m going to put this mattress to the test to see if it lives up to the brand’s claims. And who knows… if it can withstand my rigorous assessments, it might just turn out to be the bed of your dreams! To find out if this is true, continue reading below for my full review of the DreamCloud mattress. Don’t have time to read it all? Click here to skip to the bottom and check out my review summary. DreamCloud launched in 2016 on a mission to bring sleepers a luxury hybrid experience. To do this, the brand constructed a supremely tall bed outfitted with both gentle foams and pocketed coils. While the mattress has been the main focus of the retailer for awhile, it just recently debuted an adjustable bed frame as well. Though the DreamCloud mattress is a fairly unique product in the bed-in-a-box space, it still faces some stiff competition, namely from Saatva and Nectar. We’ll do some good ol’ fashioned compare-and-contrasting of the mattresses later on, but for now, let’s turn our attention back to the bed at hand. What is the DreamCloud Made Of? The DreamCloud features one of the tallest mattress profiles I’ve ever seen, coming in at a whopping 15”. 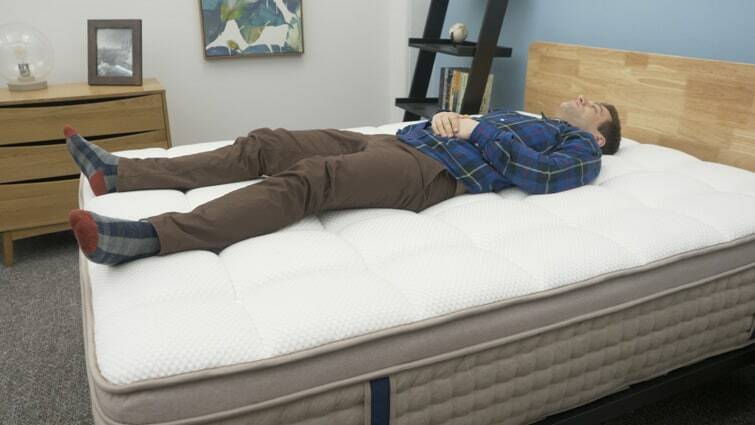 This height makes sense once you realize the design features eight different layers of foam and wrapped coil components, which work in tandem to provide the sleeper with a firm lift and plenty of comfy pressure relief. Given all the different materials at play here, I can’t wait to dive underneath the cover and see how it all comes together. Cover – The cover is made of a cashmere and polyester blend for a luxuriously soft feel up top. It’s also quilted with memory foam, which supplies the sleeper with some immediate pressure relief. Foam Layers – Below the cover, you’ll find three thin layers of foam. While these sections are soft to the touch and provide some satisfying sinkage, they also respond quickly to pressure, so you’re not likely to feel stuck in the mattress. The middle of these three layers is particularly important for the temperature regulation of the DreamCloud as it’s comprised of perforated latex foam. Latex in general is great at dissipating heat, so the addition of these small ventilations encourages even more cooling. 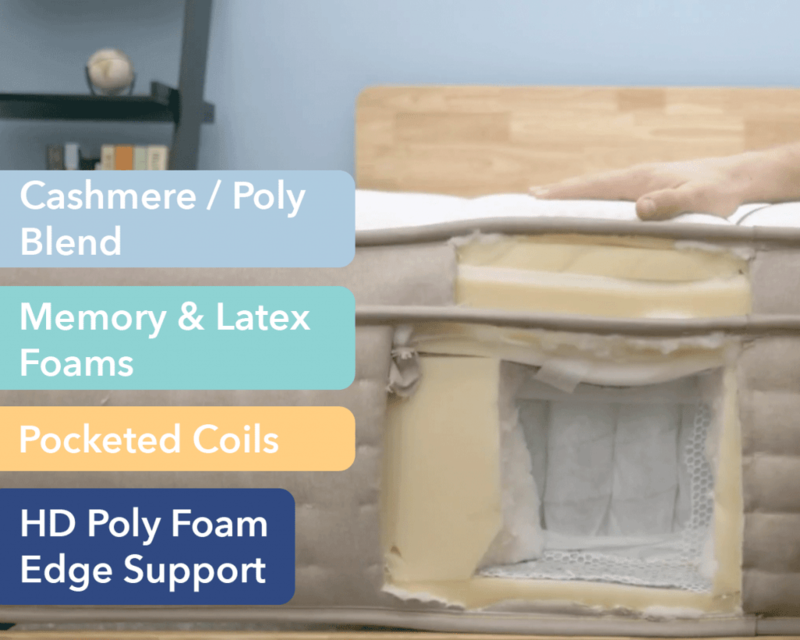 Pocketed Coils – The bottom layer of foam transitions into the firmer support section of the mattress, which is made up of a pocketed coil system. These individually wrapped springs give the bed excellent bounce and help to disperse motion throughout the structure. The coils also aid in regulating temperature as the spaces between them allow for steady air flow. Foundation Layer – A thin layer of high-density polyfoam lies at the base of the mattress, with the main function of cradling the pocketed coils and providing a sound foundation for the whole. How Firm is the DreamCloud? Now that we know what’s going on in the bed, we can start to analyze how its different materials are going to contribute to its overall feel, beginning with firmness. As I press my hand into the mattress, the first thing I notice is the plush cashmere cover. It’s wonderfully soft and provides a satisfying hand feel, which is only heightened by the memory foam quilted into it. Pushing in further, I experienced the subtle sinkage of the pillowtop layer, which rather quickly gave way to the pocketed coil support system below. As I applied more force with both of my hands, I was struck by how well these buoyant springs lifted me up and out of the structure. While I’ll certainly go into my own personal opinions on the firmness of the DreamCloud, I think it’s important to consider other perspectives before bunking in either the soft or firm camp. Why? Because firmness is a personal thing, and every sleeper is going to experience it a little bit differently. That being said, I decided to invite three of my coworkers to stretch out on this mattress and share their thoughts with me. I then averaged out our individual firmness ratings and threw it on the graph below. 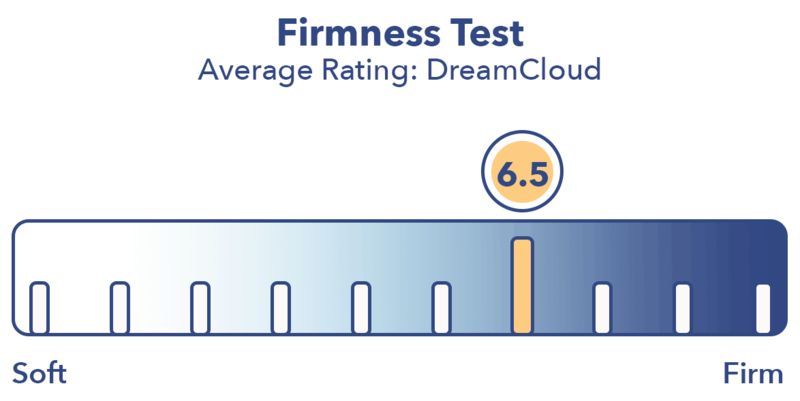 There was some discrepancy among my testers, but we all landed in the 6-7 range, winding up with an average firmness rating of 6.5 (which just so happens to sync up perfectly with the industry standard for medium firmness). This tells me that the DreamCloud strikes a pleasant balance between softness and firmness. I personally gave the bed a 7 as I found it to be a rather solid bed. While you’ll feel some slight sinkage through the plush cover and top foam layers, the individually wrapped coils make up a huge portion of the bed’s construction and will likely leave you feeling more “on top” of the mattress than “in it.” This could be a fantastic vibe for a wide range of sleepers, though I think it would probably be best suited for combo sleepers who need to change positions easily throughout the night. Any discussion of a bed’s firmness will inevitably lead to one about its ability to alleviate pressure along the body. Too soft and a mattress will leave you feeling totally unsupported; too firm, and tension is likely to crop up at sensitive spots like the hips, shoulders, and lower back. So how am I going to demonstrate whether or not the DreamCloud is any good at relieving pressure points? By stretching out on a pressure map, of course! The map creates a visual graphic of my body interacting with the bed in real time. Blue indicates little to no pressure, green/yellow symbolizes medium pressure, and red signifies high levels of tension. Back – Lying on my back, I could feel the cover and top layers of gentle foam filling in the space at my lumbar region for some satisfying pressure relief. While I experienced some initial sinkage into these layers, the pocketed coils quickly counteracted this with a strong lift that positioned me more on top of the mattress than in it. The buoyant spring of these coils also made it incredibly easy to move around and change positions. 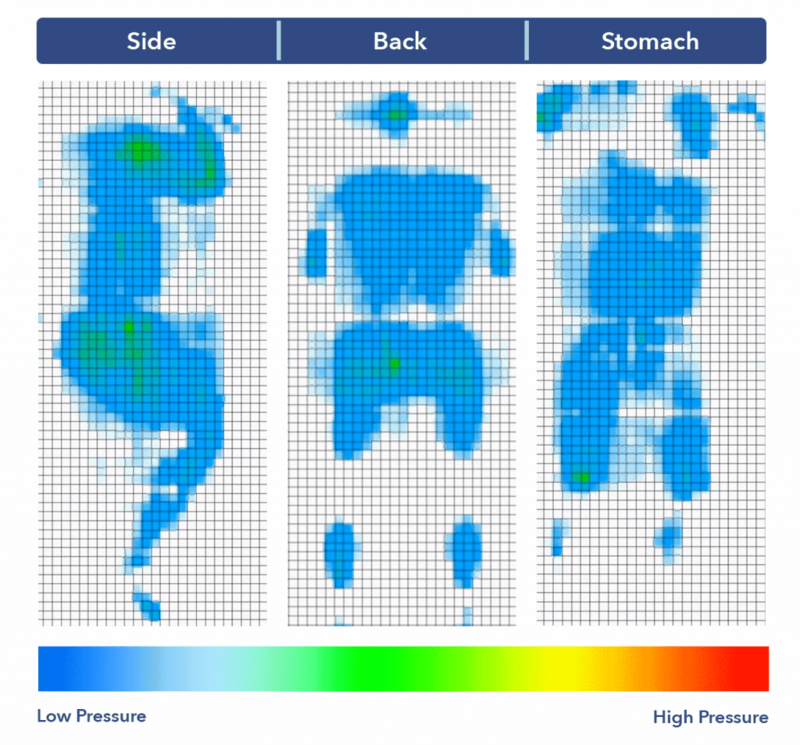 Side – As you can see in the graph above, once I rolled onto my side, I began to feel pressure forming at my shoulders and hips, typical problem areas for side sleepers. While this resulted in some slight discomfort, I still felt fairly well supported in this position, with the top foam layers working to alleviate some tension at these spots. That being said, I would recommend this bed more for folks who switch between their side and back than those who doze primarily on their sides. Stomach – Switching over to my stomach, I thought the DreamCloud did a great job of lifting my hips up and out of the structure, which is key for stomach sleepers as it promotes a natural line between the shoulders and hips. Again, the bounce of the pocketed coils made it ease to move around and change positions, a big plus for combo sleepers. After going over the finer points of the DreamCloud’s construction and feel, I think it’s high time to size it up against some of its fiercest competitors in the mattress game: Saatva and Nectar. Below, I’ll briefly highlight the most striking similarities and differences between all three beds. While the Saatva also utilizes pocketed coils, it’s got more of a traditional innerspring vibe than the DreamCloud and doesn’t come compressed in a box. That being said, both of these mattresses are extremely bouncy, and could be great for combo sleepers who need to move around and change positions. As far as price is concerned, these beds are pretty evenly matched, with a Queen Saatva ($1,100) being just slightly less expensive than a DreamCloud of the same size ($1,199). For more, check out my full review of the Saatva mattress. You could also check out my Saatva vs. Dreamcloud comparison. The biggest difference between these two beds is the absence of pocketed coils in the Nectar, which makes it much less bouncy than the DreamCloud. Additionally, the Nectar’s thick layers of memory foam produce a ton of pressure relief and body-contouring, making it a solid option for side sleepers. Price-wise, it’s also the least expensive of the bunch, with a Queen sized Nectar coming it at $699. Wanna learn more? Hop on over to my full review of the Nectar mattress. While understanding how you’ll interact with a new bed is incredibly important, it’s also crucial to figure out how your partner (or furry best friend) will impact your experience as well. 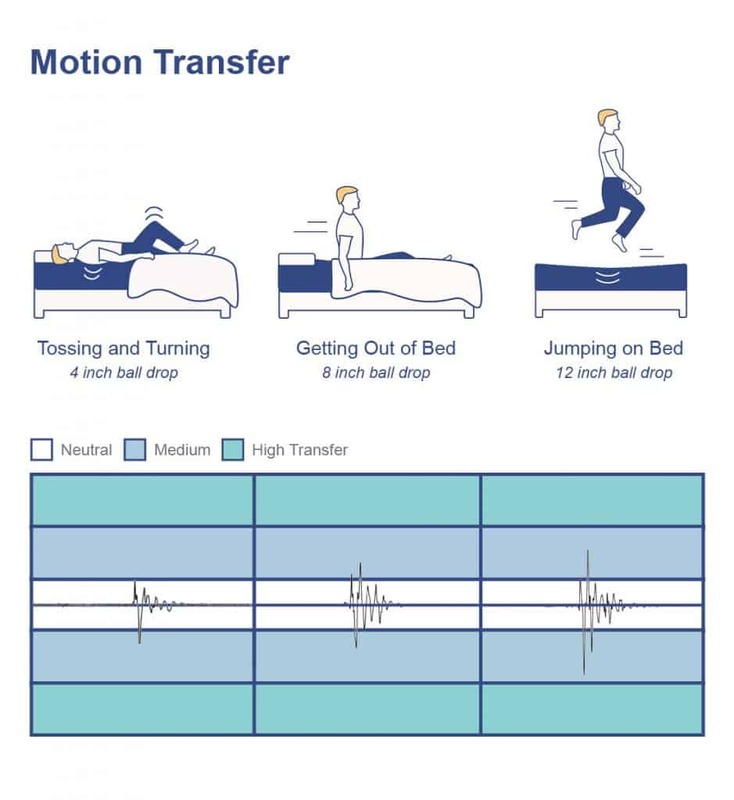 Enter motion transfer, or the amount of movement likely to be felt from one side of the bed to the other. Basically, this test will let you know just how bothered you’ll be by someone getting up in the morning or jumping into bed after you’ve gone to sleep. 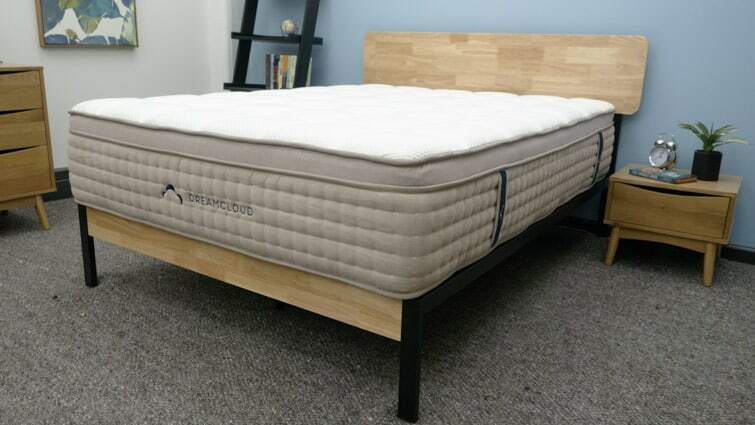 The DreamCloud shows a small amount of disturbance for the 4 inch drop, which simulates someone rolling around and adjusting their position on the other side of the bed. While the 8 and 12 inch drops show slightly larger spikes, I’d still consider the mattress to be pretty good at isolating motion, thanks to the individually wrapped coils. This means you’re not likely to be too disturbed by your bed mate’s midnight shimmies, which makes this a great option for couples. While you’re likely to experience some immediate sinkage though the soft foams up top, by the time you sink through those layers, you’ll hit the wrapped coils and feel some sturdy support. What these results tell me, then, is that you’re probably going to feel more “on top” of the DreamCloud than “in” it. This could appeal to a wide range of sleepers, but will satisfy back and stomach sleepers the most. With all our tests neatly wrapped up, it’s time to answer the question you came here asking: Is the DreamCloud mattress right for you? I’ll leave it up to you to decide, but will share a few final thoughts that might make the choice a little easier. Back and stomach sleepers – The combination of pressure-relieving foam and supportive wrapped coils makes for a sleeping experience that’ll have back and stomach sleepers celebrating. 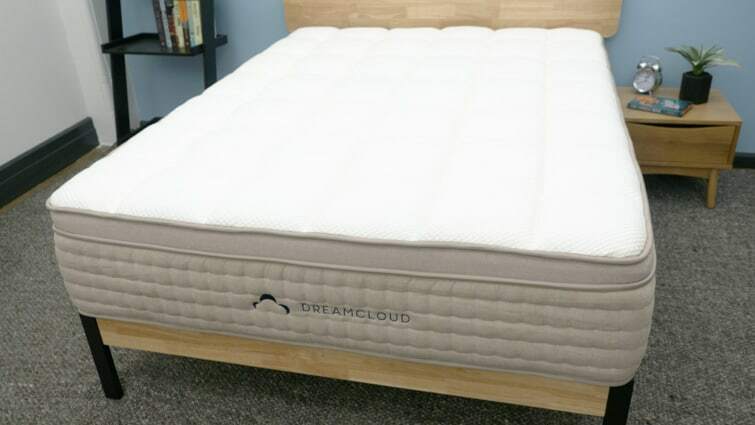 Want a luxury feel at a value price – A mix of plush memory foam and cashmere gives the DreamCloud a luxurious feel at a price that’s pretty hard to balk at. Couples – The individually wrapped coils are excellent at isolating and controlling motion, making this a great pick for couples with different sleeping habits. Lacks contouring – A tall section of pocketed coils makes for a sturdy bed absent of the kind of body-contouring you’d find on something like a memory foam mattress. 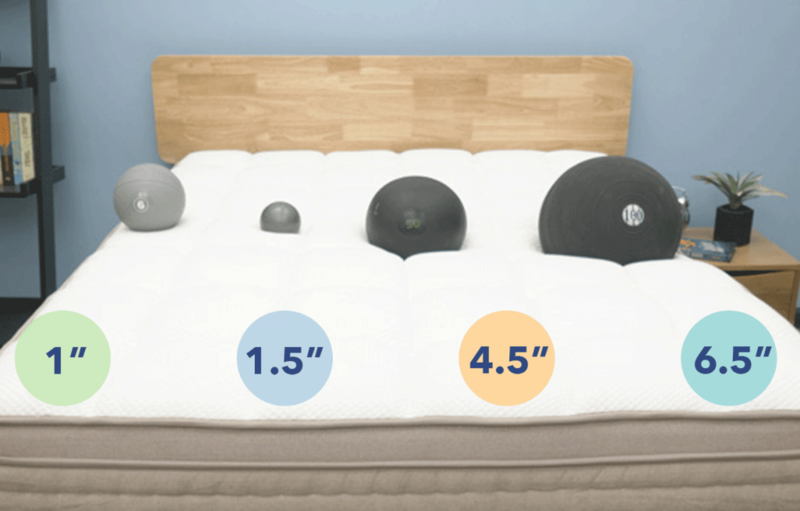 Too soft for heavier stomach sleepers – While the DreamCloud could be a great fit for heavier side or back sleepers, I think the soft foams up top might cause heavy stomach sleepers lower back pain. Sleep Trial – 365 days. 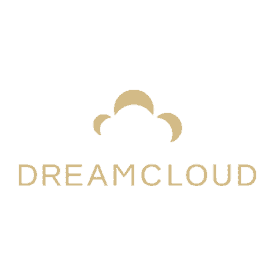 Warranty – DreamCloud’s Everlong warranty is a lifetime guarantee. Shipping – Free, comes compressed in a box. Bonus – One free cleaning with purchase. If you’re convinced the DreamCloud is the right mattress for you, the size and pricing information for the mattress are below. Please note that these prices reflect standard pricing, but coupons are often available.